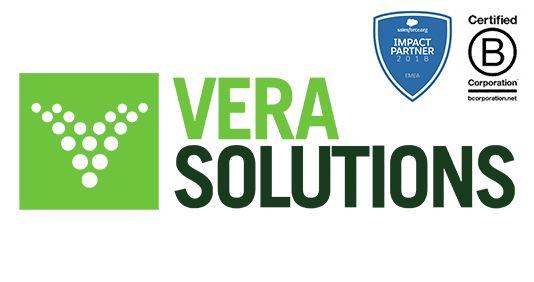 Vera Solutions is a social enterprise and certified B Corporation building cloud and mobile applications for social impact organizations worldwide. Our clients — more than 250 organizations in over 50 countries — include major iNGOs and grant-making organizations, social enterprises, and community-based organizations. Our solutions help organizations working in health, education, and development to collect, analyze, and utilize real-time, high-quality programmatic data, automate processes, and work more efficiently and effectively. Vera’s work is centered on the Force.com platform, the world’s leading cloud application development platform. Vera is a growing organization, with 50 full-time staff based in offices around the world, including Washington DC, Cape Town, Mumbai, and Geneva. Vera opened its office in São Paulo in August 2018 with a team of two people: Alan (Lead Consultant) and Cintia (Associate Consultant). They now need a third person to give more capacity to deliver projects, building systems for Brazilian, Latin American, and North American social impact organizations. The Salesforce Consulting Intern will work on Vera project teams to configure program monitoring, management, and evaluation systems for clients. You’ll be expected to get your hands dirty from the get-go. Interns are involved in key pieces of project’s lifecycle — building online, offline, and mobile data tools, creating training materials, and supporting system implementation and rollout. A large amount of your work will be technical, involving many aspects of Salesforce configuration, but you will not write code. As a Consulting Intern, you’ll gain valuable experience with Salesforce (the world’s leading cloud-computing platform, currently used by more than 150,000 for-profit and 30,000 non-profit organizations worldwide). You will gain first-hand experience implementing program monitoring, management, and evaluation systems in health, education, human rights, and other development sectors, while working in a global marketplace.